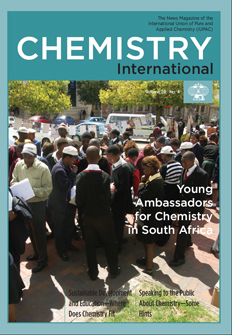 Cover: The week-long Young Ambassadors for Chemistry (YAC) event culminated in the central square of Grahamstown, South Africa, where the teenagers pictured interacted with the public and showed them what they had learned about chemistry. Around 80 students in their school uniforms spent the afternoon on the square showing the public that chemistry is part of life and that it can also make it better. The square was decorated with posters from the competition Chemistry for Humanity. See report on page 21. Page last modified 27 July 2007.